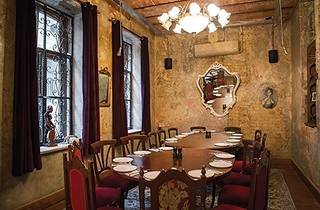 ANDREA IS NAMED AFTER the Aya Andrea Church built in 1867 as lodging for Russian pilgrims arriving in Istanbul on their way to Jerusalem. The restaurant is located in the renovated guesthouse of the church, whose top floor is still used as a chapel. The waiters happily show guests around the two-and-a-half story space, including the mezzanine. As soon as you enter the restaurant your eyes will be drawn towards the large chandelier and colorful wingback chairs. On the second floor you’ll find two elegant rooms that are better suited for formal dinners. 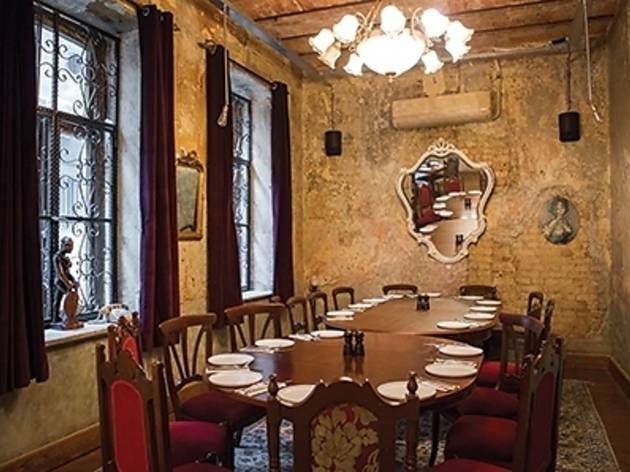 You can also rent out these rooms for private events or dinners of up to 10 people. The restaurant’s chef is MSA graduate Pelin Aslan, whose boneless chicken wings are quite popular. They’re reminiscent of General Tso’s chicken, but with a hint of tamarind in the sauce. Just about every main course comes with a different take on potatoes: fries with truffle oil and parmesan are served alongside the Café de Paris steak, potato confit with mustard sauce alongside the chicken schnitzel, and potato puree with truffle oil alongside the chicken with parmesan. On weekends after 22.00, the lights are dimmed and the music is turned up – and suddenly this historic building turns into Karaköy’s newest party locale.